The Dublin Arabic Film Festival returns to the IFI this year, once again presenting the best of Arab film culture to our audiences. Opening Film: Clash, Friday, 11th November. 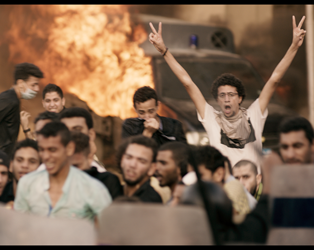 In Egypt 2013, president Morsi has been toppled; as riots break out a disparate group is rounded up into a police van in director Mohamed Diab’s bracing political allegory, the opening film of the Un Certain regard strand at this year’s Cannes Film Festival. Diab brings real cinematic flair to the claustrophobic scenario, aided in no small way by his script, co-written by Khaled Diab, which delineates the complexities of multiple characters and their motivations in lucid fashion. This screening will be pre-ceded by Jim Sheridan’s new short film, 11th Hour, starring the Mexican-American actor Salma Hayek, which is set in a New York bar on the day of the 9/11 attacks.